Bottom right hand corner, just after the heart warming statement that T-D: Terminator Dog had been shown at the Ninth Puchon Fantastic Film Festival (Pifan), is the original title of the film "ROTTWEILER". Even on the Pifan website, the film is listed as "로트와일러 Rottweiler", so the distributors have deliberately altered the name of the movie after its original festival presentation. But what of the cover picture? That shot of the robotic dog is not exactly what I would call a rottweiler (looks a little bit like a wolf to me) and is more than a little reminiscent of the dvd cover for Terminator 3: Rise of the Machines. Has somebody been to the plagiarist school of cover art? The original image for "Rottweiler" is much less copyright infringing, so why not use that instead? Probably because it's not very good, but that is beside the point. 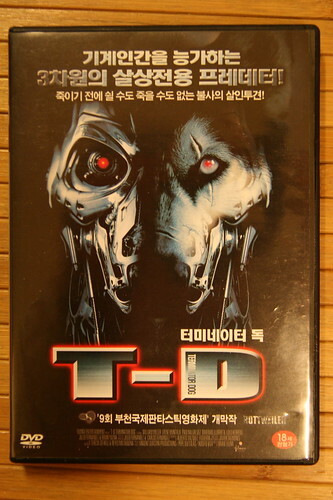 Well for 3,000 won, you get what you pay for... a crap Brian Yuzna film about a naked convict being chased by a cyborg dog with blue eyes. Ha, I was out at a DVD bong with a waegook friend of mine last night and we watched this cinematic masterpiece. I was telling an American friend about the wonderful beauty of T-D and she googled your page. I think I'll have to see if I can find a copy of this to bring back to California when my contract ends. Have you seen the commercial with a Korean version of Trio doing "Da Da Da" showing the Hyundai that rips off Mercedes? Basic idea taken from a VW commercial but the footage doesn't match at all.